The Glasshouse is quite a dark tale, incorporating themes of mental illnes, perfection and paranoia. With pumpkin-coloured hair and freckles, Clara lives in a glasshouse, growing perfect pumpkins. Each of her pumpkins is identical and bl emish free, a little like the fruits and vegetables which we find in our supermarkets. Clara has little contact with the outside world until she notices that other greenhouses,which aren’t so perfect, are encroaching on hers. Clara’s paranoia about her perfect pumpkins grows, until she speaks to a boy who shows her that pumpkins don’t need to be perfect to taste good and that the outside world isn’t as scary as it appears. The moral of this story appears to be that people who live in glasshouses SHOULD throw stones, as Clara picks up a stone to smash the windows of her own glasshouse. On it’s simplest level, it’s a story about making friends and taking risks but there is a complicated sub-text beneath the pumpkins. Thompson’s beatiful illustrations of pumpkins adorn each page, from the early pages with seed germinating, to the final page with pumpkin flowers and curling tendrils. There are lots of opportunities to link to seed growing experiments the requirements of living things. Clara’s pumpkins need light, warmth and fertiliser and we can see the lifecycles of plants with flowers and fruits. I could also see discussion opportunites for what greenhouses do and why they are used, which in turn leads to discussion of the green house effect. It might also be interesting to compare the appearance/taste of fruits and vegetables purchased from supermarkets compared with those from a local farmers’ market or home grown. There are comprehension questions on the publisher’s website here and a number of activities which touch on other KLA areas, not just science. There are facts such as pumpkins are monoecious, which means they produce both male and female flowers on the same plant.There are also references to different types of gardens/gardening such as hydroponics and vertical gardens. The Box Boy loves to collect things, especially boxes. He’s a true recycler and a model for sustainability as he builds structures out of cardboard boxes which are simply too good to throw away. He becomes famous after he conststructs a model of the Eiffel Tower but soon tires of fame and returns home to come up with new ideas. Webster admits that the box boy is really a younger version of himself. 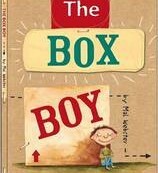 A teacher/author/illustrator and graphic designer, Webster created The Box Collecting Boy for his Master’s degree in Visual Arts and Design at Latrobe Uni. Prior to publication, his work was on display so if you’d like to see a picture of his real Eiffel tower, you can do so here. The Box Boy is published as a Helen Chamberlin book by Windy Hollow Books. Formerly at Lothian, Chamberlin is a multi- award winning doyen of Australian childrens publishing. I see this book as leading to all sorts of exciting activities centred around materials testing and construction. Measuring (maths) and art can also be incorporated. Cardboard is used widely for a variety of purposes because it’s lightweight, strong, cheap…Students could come up with lists of where and why cardboard is used. You can find some information on the properties of cardboard here, or through any simple google search. The Box Boy isn’t the only one who would like to live in a cardboard box. There is a lot of research into using it as a sustainable building material and again, a simple search on the net will lead you to lots of articles and pictures. Try here as a starting point. Cardboard is also used as a furniture material. I found some great pictures here but I’m sure children will enjoy collecting their own pictures. Students could come up with their own experiments, to develop science inquiry skills, such as insulating properties of cardboard or biodegradability. They could look at why corrugated cardboard is stronger than plain cardboard. Overall, I loved the simplicity of this book, with it’s cheeky little boy and his fantastic creations. There’s also a nice little message about fame not being all it’s cracked up to be and that life should be about creating things that are worthwhile. Objects are made of materials that have observable properties. This isn’t strictly a review a such…It’s some thoughts about using a traditional text in the primary science classroom. Earlier this year I asked a group of primary school teachers what books they used to introduce science ideas in the classroom and a couple of teachers said that they had used ‘The Three Little Pigs.’ Later, passing a charity shop in Williamstown, I spotted a lovely pop up copy of this classic tale and snapped it up for use in my workshop. I began thinking of all the fun things I could do with the three little pigs…if only I was a primary school teacher! Three Little Pigs allows teachers to cover properties of materials and materials testing, particularly some of those early ideas in the chemistry strand. Also, students can make a hypothesis, design, test and evaluate, so it’s perfect for developing science inquiry skills . Dress up, act it out…link literacy and science. At Acle St-Edmunds school in the UK, students built houses out of various materials and tested them using a big bad wolf fan. They’ve uploaded photos to show how they tested the strength of their houses. I found a website dealing with supplementary materials such as posters and design sheets. Closer to home, some instructions for building houses with e-how family. I’m sure you’ll be able to find lots of ideas with only a few minutes trawling on the internet. Look at different building materials, traditional and new. If you can find an old copy of Pearson’s Comet Magazine, isuue 1, 2006 contains an article on Earth houses; looking at unusual types of building materials such as straw-bale houses or mud-brick houses. There are teaching notes here. I'm a children's author and secondary science teacher. You can subscribe to the blog for regular updates...and if you like an idea, please share it with friends and colleagues through social media.